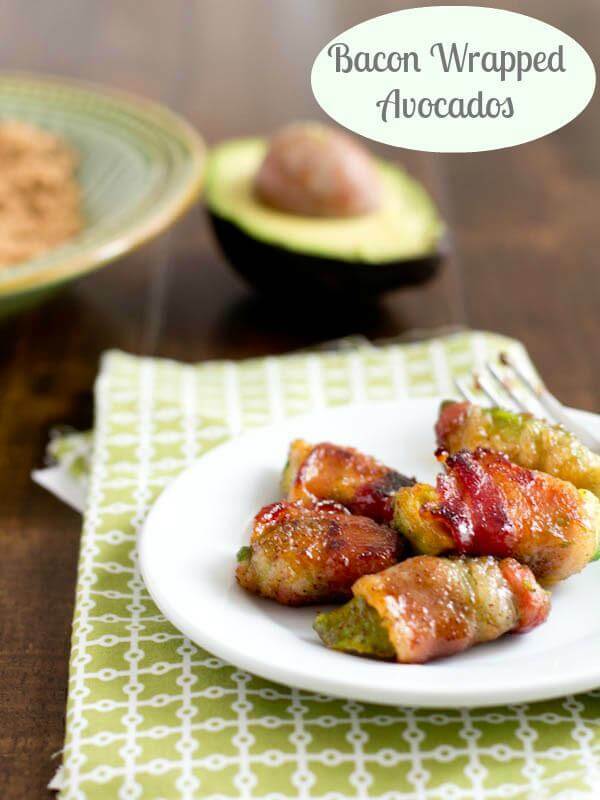 This Bacon Wrapped Avocados appetizer recipe is sure to win over everyone you know.Crispy brown sugar bacon wrapped around a creamy avocado, and it’s easy! I pretty much love pork. It’s wonderful. I love it in all shapes and forms. I love bacon, especially when it is baked in the oven, not fried in a skillet and even more so when it’s wrapped around a creamy avocado and baked to perfection. 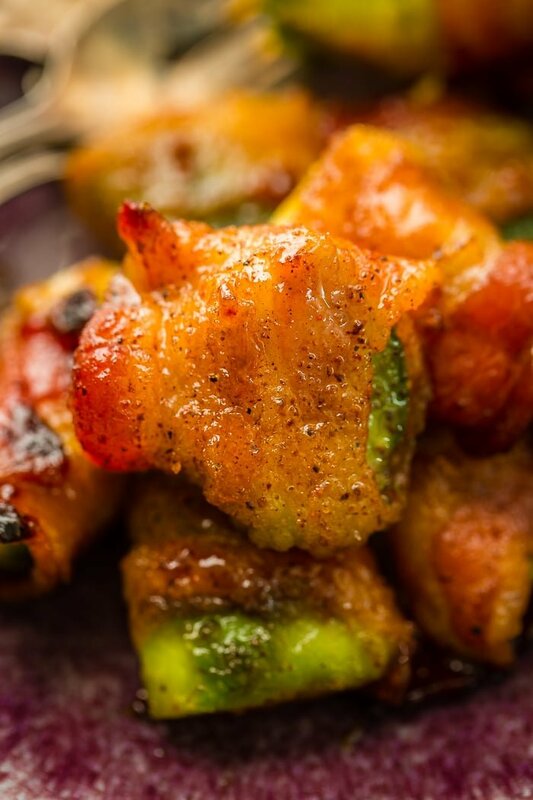 These bacon wrapped avocados are about to rock your world. I am embarrassed to admit that I used to be a bacon hater. Yup, it’s true. I used to think that bacon was fatty, chewy, nastiness. 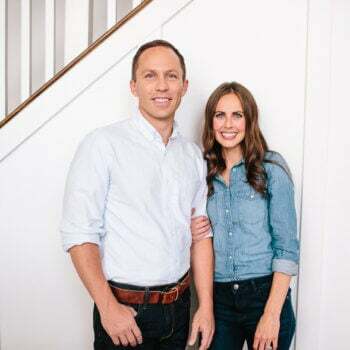 In fact, I hated it so much that I would take the time to pick it out of sandwiches, off of chicken dishes, and I certainly would never touch the stuff at breakfast. Thankfully I grew up and realized that bacon is life. It’s crunchy and flavorful. You just want to wrap yourself in it. Bacon, is the new cashmere. 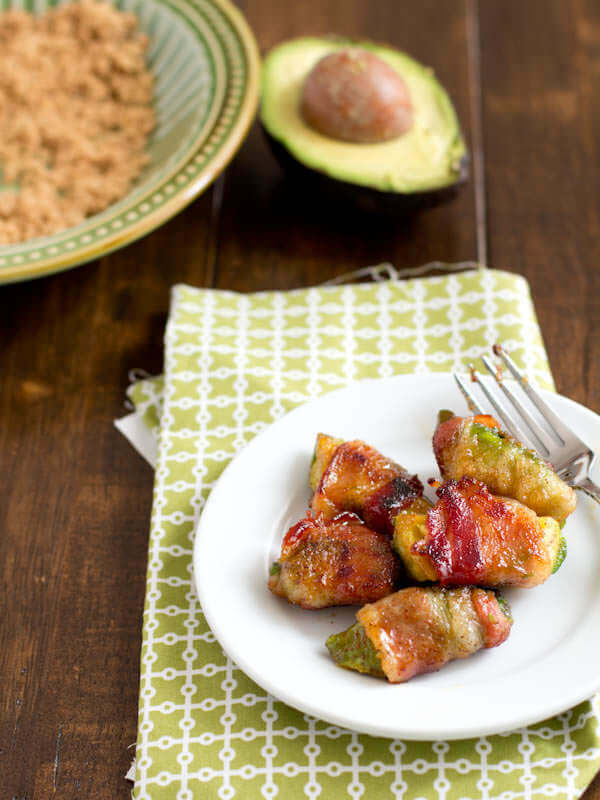 Or at least these bacon wrapped avocados are. A few weeks ago I was trying to think up a way to use the last of my avocado. It was lunch time, and while this Wrap with a honey Avocado dressing is pretty much the best thing in all the world, as is a little BBQ pork and guacamole grilled cheese, but I really needed something else. 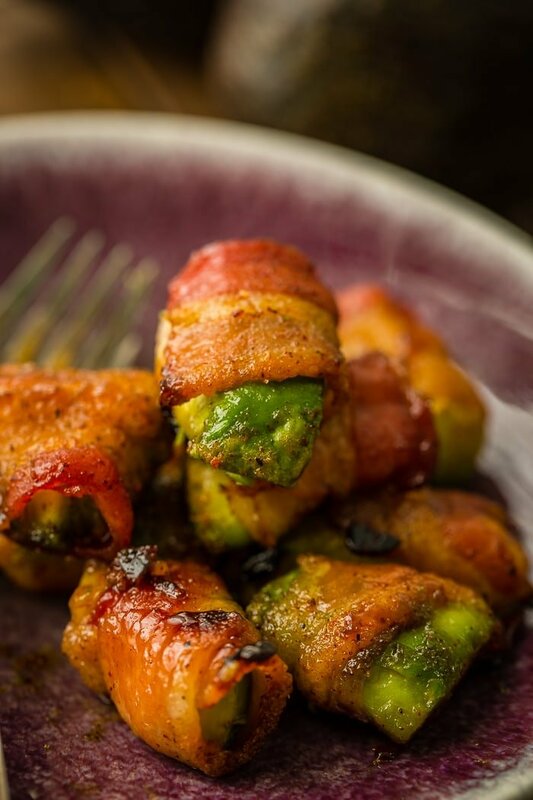 I had just come home from the grocery store with a delightful little bag of avocados and I decided to forgo the bread and make something a bit broken down, bacon wrapped avocados and boy was it awesome. The key to any recipe with bacon, especially an appetizer like this one where the bacon is the star of the dish, is to buy the right bacon. We’ve really fallen in love with Wright’s Bacon, but if you have a brand you recommend we would love to hear about it. Just wrap your avocados in the bacon and then dredge in a brown sugar and chili powder mixture. Bake until the bacon is crisp and beautiful. Sweet deliciousness this was good. Probably the best lunch ever! And because I’m trying to be good about balance, I figured I should add a little calcium and fruit in too. So, I went ahead and added apples and laughing cow cheese. I know I don’t get nearly enough calcium in my diet, and I wonder how many of you are the same? What ways do you incorporate dairy into your diet? And have you joined the bacon bandwagon? 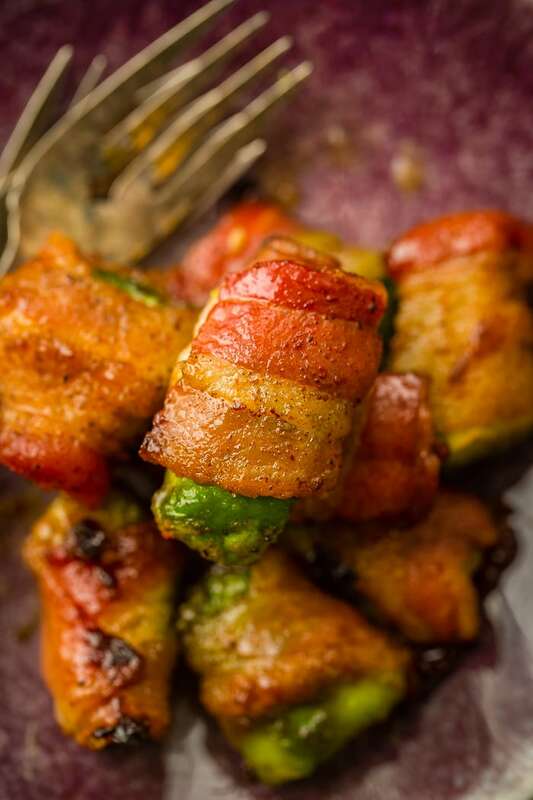 I’m sure you will with these bacon wrapped avocados. I have a secret pet peeve when I’m at the grocery store. You see, when I’m standing there picking out produce and someone is picking up avocados in the palm of their hand and squeezing it with fingers wrapped around the entire body, or grabbing fruit after fruit and squeezing with their thumb and fingers it takes everything in me to not ask them to stop. Testing the avocado fruit like that only bruises it, even if it isn’t ripe yet, so it’s ruining the avocado for others. Instead, to pick a ripe avocado, place your thumb on the bottom and your pointer finger on the top and if it yields to gentle pressure it should be eaten within a day or two. Unripe, firm or green fruit can take four to five days to ripen at room temperature. Avocados should be stored at room temperature in one layer and not by any citrus fruits unless you’re looking to ripen them quickly. Once the avocado begins to yield to gentle pressure, place it in the refrigerator to slow the ripening process as this will prolong its life. Also, storing avocados in wire framed bowls can lead to bruising as it ripens and settles into the wires. How Long are Avocados Good For? Avocados on the counter that started out green could take 5 days to ripen and then will need to be eaten. Refrigerated avocados that are ripe will only last for 2-4 days. 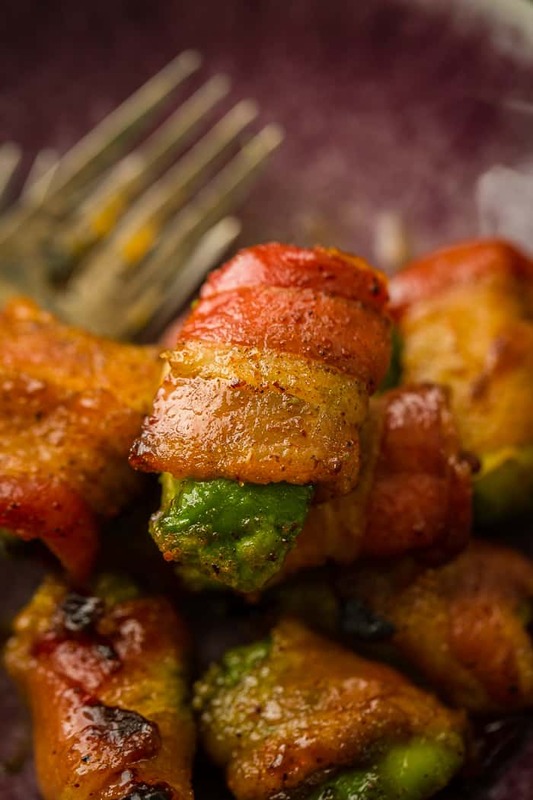 This Bacon Wrapped Avocados appetizer recipe is sure to win over everyone you know.Crispy brown sugar bacon wrapped around a creamy avocado, and it's easy! Cut open the avocado and remove the pit. Slice about 3/4" slices lengthwise through the avocado, and then cut through the middle to cut all of the slices in half so that you have thick chunks of avocado. Cut each slice of bacon in 3-5 pieces and wrap each piece around the avocado. Roll in the brown sugar mixture and place on the baking sheet. Bake at 425 for 10-15 minutes. Remove from the oven to a platter and stick a tooth pick in each for serving. I pit my avocados by smacking my blade into the pit and giving it a quarter turn. The pit pops right out leaving the perfect flesh behind. Depending on the size of your avocado pieces and length of your bacon you may get a different number of chunks of bacon. I wrap an end around the first piece of avocado just to measure and then cut all of the bacon together accordingly. 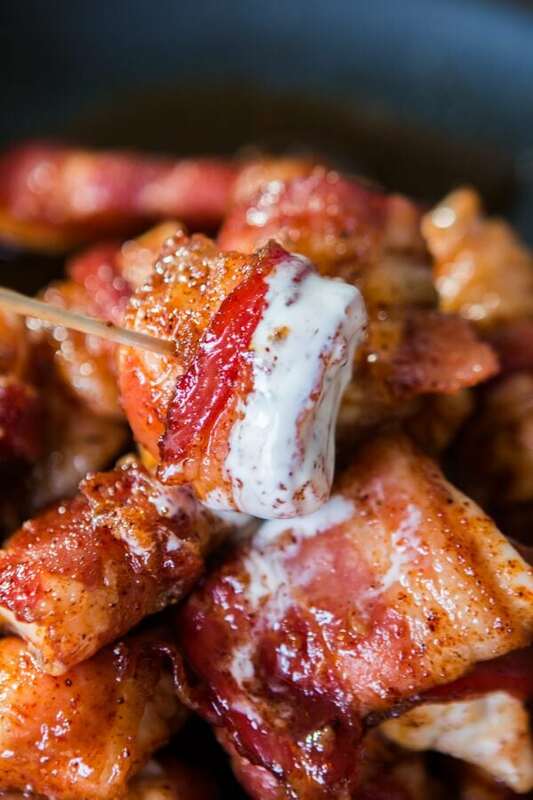 Brown sugar bacon wrapped around juicy chicken and dunked in creamy ranch. 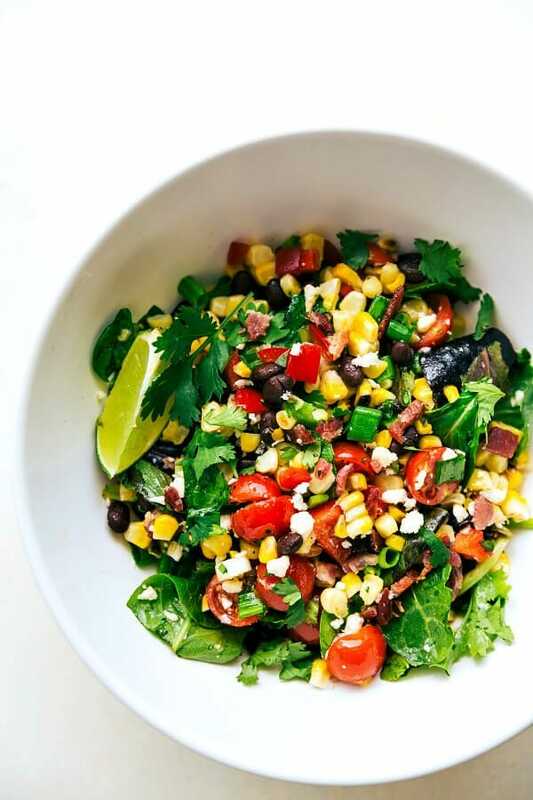 There’s nothing better than corn and bacon all stirred together in a big bowl of deliciousness! *this was a sponsored post, but my opinions remain my own. I was looking for this bacon wrapped avocados. I find this article today. This is really helpful to me. I do not have access to pre-cooked bacon so I did it myself. I ran the bacon under cold water then baked it until it was partly cooked but still flexible. Before wrapping the avocado, I sprinkled it with salt, pepper and lime. Turned out great and works well with my keto lifestyle. Yay! Great tips! Thank you! Suggestion: poach egg, fry bacon, slice avocado (separately!). Put on plate. Oh man! I’m so sorry Heloise! Did you watch the video that goes with this recipe? It is down at the bottom of the post. They hold together great in the oven. I discovered this post only yesterday. I see you’ve thought about Bacon Wrapped Avocados earlier than us. But I don’t expect you to end your discussion on the specific matter so soon. Can’t you please share more of your insights into it. Really, our neighbor groups who visit our website- Spottingpro oftentimes would be happy. Thanks a lot, Carrian! That’s a good idea with advocado wrapping. I often fry bacon with okras, they are really delicious together. Especially, you should try with green salt pepper sauce. Do you know if this would work with turkey bacon? We’ve made it with turkey bacon and it worked great! Do you cook the avocado still in the skin or do you peel it first? So glad to hear that and we can’t wait to hear about the grilled bacon! yum!!! Hi, can I make these in advance without the avocado going brown? Can I cook them then reheat slightly?!? Ohhh, two of my favorites – bacon and avocado! What a great combination! 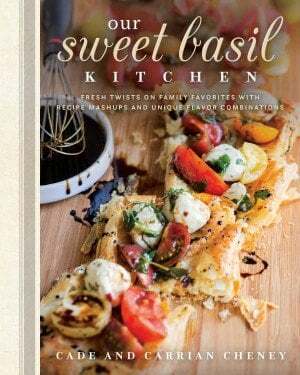 This is definitely going on the menu this week! They are so good! Hope you enjoy! OH.MY.GOODNESS. This sounds absolutely fantastic! Do you think that I could leave out the sugar (whole30)? 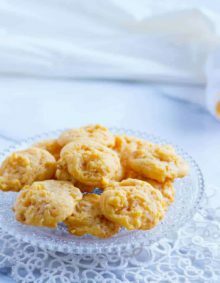 The brown sugar is kind of the main thing about the recipe, but you could always just do bacon and it would just be different which isn’t bad! Is there a substitute for sugar that we can use? Thanks! You could try coconut sugar. It can replace white or brown sugar with a 1:1 ratio, equal. 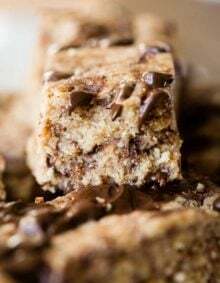 Do you think you can use “Just Like Brown Sugar” sugar substitute? Sounds like a great recipe! Thanks! I’ve never even heard of that!! I’ll have to google it! Thanks Olga! We love these! 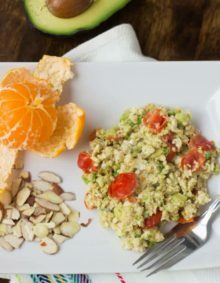 Your recipe sounds delicious, however I do have a question concerning whether on not the bacon is crispy before the avocado turns bitter as I have heard that avocados can get bitter if heated too long. Have you ever tried your recipe using pre-cooked bacon? Those look delicious! Can attest that they taste delicious too! My wife made them for me using your recipe. Want to see? So glad you enjoyed, thanks! I landed here seeking ideas to use up 2 avocados I have.. and I found perfection! This is a keeper, thank you! Hi Emily! I usually buy mine at Costco or McCormick. I’ve GOT to try this! Now, thanks to you I have the reipce’ in a good place.Looks yummy (less messy too) And the extra time . hmmm I think I can find something to do. What this is brilliant two of my favorite foods bacon and avocado. Love that analogy…but then I’ve always loved bacon. Have you ever cured your own? If you love it now, well, you must try it; there is no going back! Pingback: Easy Gingerbread Trifle and a chance to win FOUR Harmon Grocery Gift Cards! I wish we had places like Harmon’s around Louisville! Sounds like a great concept. And this appetizer is definitely unique and, I’m sure, tasty! OH man—totally craving these now! Okay, I’ve got to try this!! Yum!! yum! bacon is the new cashmere 🙂 every night, my husband says the only way the recipe can get better is with bacon! I love the cheese counter at Harmon’s…no lie. Seriously the best cheeses ever. Holy cow, I love this so much. I adore bacon, and avocados, so pairing them is perfect!! And I love Harmons as well – wish there was one closer to me! Mmm. Bacon IS the new cashmere. And I’m with you on the bacon-haters-turned-lovers-boat. Isn’t it a great and tasty side to be on?